Please join us for this roundtable discussing ‘Surveillance on the Ground’ as part of the 8th Annual RIC Conference “Eyes on Surveillance: (In)security in Everyday Life” on Saturday, April 6 from 4-6 p.m. in Sherwood Room, Levering Hall. 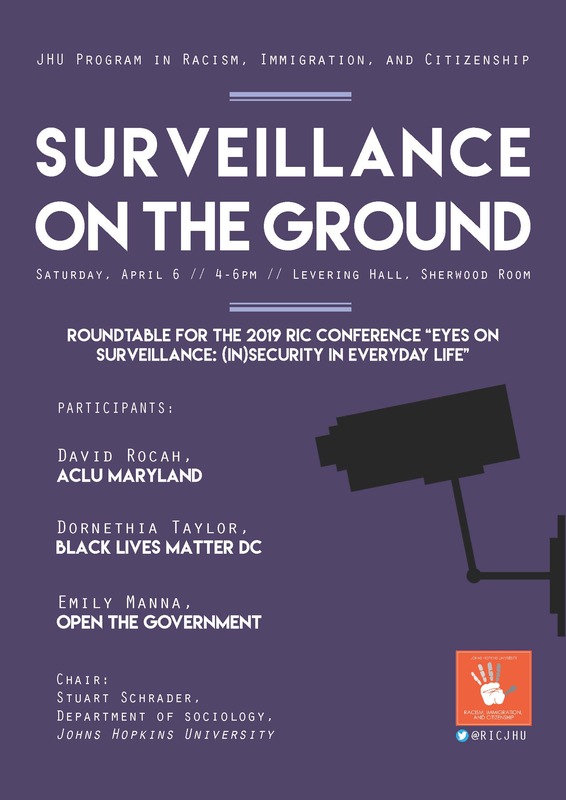 This roundtable brings together Dornethia Taylor from Black Lives Matter DC, David Rocah from the ACLU, and Emily Manna from Open the Government to speak about their work on surveillance and how surveillance affects their professions. Together they will discuss government surveillance in the United States and abroad; what personal experiences they have had with surveillance in their work; the relationship between surveillance and technology; and the links between surveillance and violence.